Why, every fault's condemned ere it be done. Fawlty Towers: Fully Booked, by Morris Bright and Robert Ross, is a reference and photo-book to the British television series, Fawlty Towers, which ran for a total of twelve episodes in 1975 and 1979. You may ask if there is method behind the madness at Fawlty Towers? Is there innocent logic behind the devious loquaciousness? Since this little review of the book is stood on its head, so to speak, before we mention the contents of Fawlty Towers: Fully Booked we shall consult a famous English expert on the logic of tourism, applying this to the Fawlty Towers series itself. Let's postulate that you blithely are tourist-tripping toward Torquay, and the logic of your situation suggests staying at the notorious hostel, Fawlty Towers? Oh, these towering, tourist-tripping times! Oh, the Faulty Premises! Dear tourist, this path that you follow is false logic, and the premises of Fawlty Towers constitute an uproarious nexus of faulty logic. Run, don't walk, in any other direction. Here is another opportunity, gentle Reader, for playing a trick on your innocent friend. Put the proposed Syllogism before him, and ask him what he thinks of the Conclusion. You may then explain to him, as a convenient test of the soundness of a Syllogism, that, if circumstances can be invented which, without interfering with the truth of the Premisses, would make the Conclusion false, the Syllogism must be unsound. Book V, Chapter II: Problems in Syllogisms. That's logic, after all. But you may — and I hope you shall — safely enjoy Fawlty Towers on television, video, or DVD. 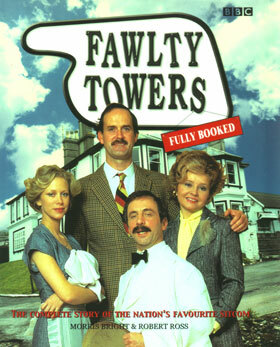 In a way, Fawlty Towers: Fully Booked is the appendix of notes, commentary, cast interviews, and illustrations for the text, which latter unadorned may be found in John Cleese and Connie Booth's The Complete Fawlty Towers. And of course, logic compels us to admit — and remind you — there also are the twelve delightful performances. Without such logics, but with thoughtful appreciation, in Fawlty Towers: Fully Booked , Morris Bright and Robert Ross tell and show us many supporting Circumstances in and around the harrowed Premises of Fawlty Towers to further our enjoyment.